invented. You've done a good job." on the phone started off talking about using wood screws. If I was going to install rr spikes I would need to go out and buy the tools as well as the spikes. I find it very easy to slip on and tighten up to the point where the 5th string is in tune I've tried dislodging the capo, by flicking it up and down, shaking the banjo, and gently bumping the neck against the palm of my hand, but it stays on fine." "It could get lost, probably not as easily as a pen capo, but maybe as easily as picks, and some folk pay pretty good money for picks." "It's easy to use and it I think it has improved the dynamic quality of the note when I play the 5th string (which is alot). It adds body to the sound quality without any distortion, its a clean note and once set up (a few twists of the tensioning screw) I found there were no buzzes. 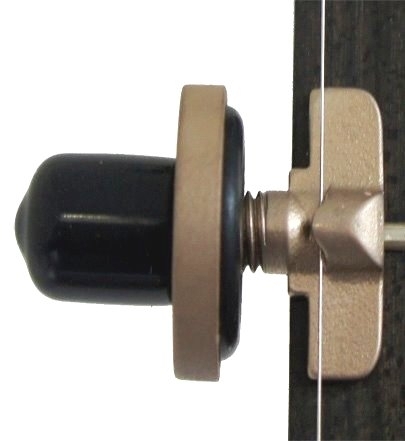 capo easily up and down the fretboard and the string remained in tune. It takes a little to get used to the initial setup, it has a tensioning screw which pushes a kind of rubber washer against the side of the neck once it was set properly I found it only needed fine adjustments as I changed the position up and down the neck. I am quite percussive in my right hand technique and I found the capo was rock steady. It took a few plays to get used to the look of it hanging on to the side of the fretboard, it kind of blends in so very quickly I got used to the look and feel. I play alot on the 4th string bass runs and licks,it didn't interfere at all with the movement of my fingers as I played below it. Is this capo made from metal or plastic? The part of the capo that touches the 5th string is METAL. 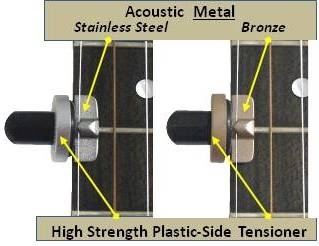 It is this special grade of metal used in either stainless steel or bronze capos that improves the timbre and sustain, maximizing the tone of your banjo. The side tensioning adjusting knob is an engineering grade of plastic designed for strength. I don't have a PayPal account. How can I buy one? No problem, our website shopping cart lets you buy securely with or without a PayPal account. See details at end of these FAQ's. A company focused on developing creative banjo accessories. An Australian company staffed with American product development engineers and pickers from Kentucky and Australia. 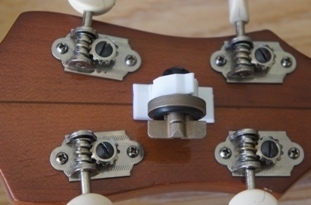 Major products include the newly patented side tensioned 5th string banjo capo. This is a relatively new capo product (perhaps the first new 5th string capo design in the 21st century). These side tensioned capos have been sold into the USA, UK, Canada, France, Germany, Australia and many other countries since 2012. What is 5 string banjo "side tensioning"? Why is 5 string banjo "side tensioning" beneficial? 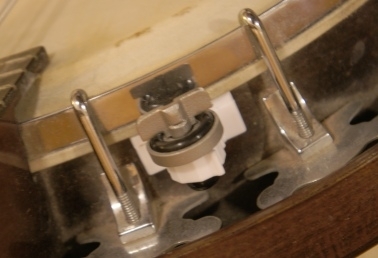 With the fifth string in contact with the capo slot, vertically and horizontally, banjo string vibration is better transferred to the instrument for a better timbre and sustain. What benefit does this banjo capo have over other 5th String Capos? Better tone creation, no holes to drill, removable when not needed, can be used in more positions on the banjo neck. 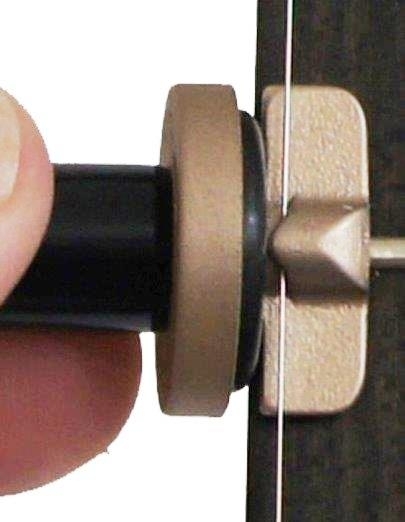 What is the proper way to side tension the banjo capo? 1. Insert the capo under the string and over the fret. Make sure the slot under the capo is centered on the fret, the bottom of the capo is flat on the neck and the string is in the slot on top of the capo. 2. Make sure that when tightening, the capo doesn't move off that position and sit half on and half off the top of the fret, an angled capo lessens tone and more importantly lessens stability on the banjo. deflection (side-tensioned) and the end of knob travel. Will it damage the banjo string? The pressure exerted on the banjo string is no more than other banjo capo devices. Will it damage the banjo neck? Hey! competitive capos require drilling holes into your banjo. HOLES!! Not having to drill holes is a benefit and the side tensioning knob has a rubber bumper to protect the side of the banjo neck. Under proper use and care users report no problems. Will it take the string "out of tune" when I lift the string? 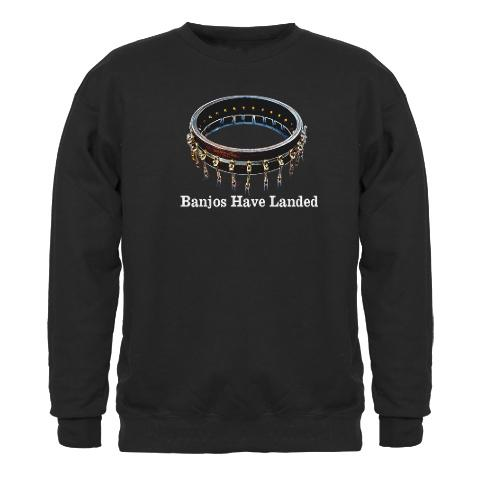 Will the banjo capo work on all 5 string banjos? Yes, unless the banjo bridge is highly misaligned,(in which case, it should be centered anyway) or the "action" is set up to an unusually non-standard height. Which banjo capo sounds best, bronze or stainless steel? Users report no specific preference. Open back banjos seem to benefit from the material properties of our stainless steel banjo capos but bronze is cool! 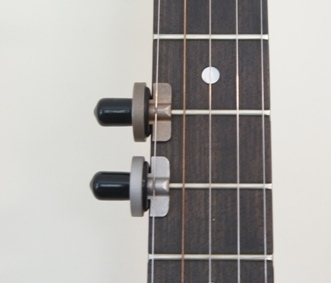 Which banjo capo looks the best, bronze or stainless steel? It's a personal choice. Here is a side by side comparison. Why does your capo cost a little more when compared to others? 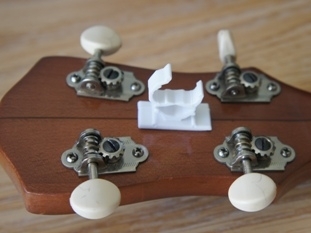 The Banjo Highway capo is a unique design that requires a unique process to manufacture. Each capo is tested and fine-tuned on a banjo. 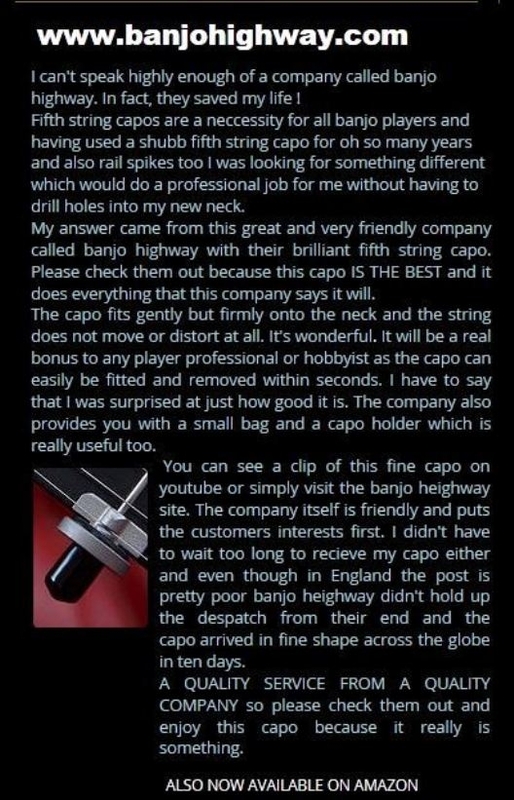 The cost when compared to the combined cost of other banjo capos and luthier fees to install them, usually make the Banjo Highway capo a cost effective product. How does the Banjo Highway capo compare to other "inserted" free standing banjo capos? Other methods use plastic or felt to make contact with the banjo neck. The result is a dull sound and a visually inferior appearance. The Banjo Highway 5th string capo looks great but above all else, sounds better. Does the Banjo Highway capo work on a radiused neck banjo? Yes it does. Some guitar players use it on the 1st string of the guitar which is also a radiused neck for alternate tunings. Does the Banjo Highway capo work on a banjo that already has spikes installed? Certainly it works further up the neck where no spikes exist or where other fixed capos run out of sliding travel. The best answer, however, is "maybe". 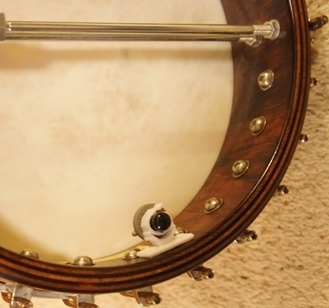 If the spikes were installed EXACTLY centered between the frets, it probably will work, otherwise, the spikes will interfere with proper positioning of the Banjo Highway capo. See the first testimonial above from a user. Contact us for more information. I'm afraid that I will lose it. Same problem with finger picks, tuners, and regular capos. To help solve all these problems a microfibre accessory pouch (shown below) is included with each Banjo Highway capo to store these items when not in use. Additionally, a plastic "gig clip" is included with each purchase. It can be put it in various positions as shown below. Can replacement parts be ordered if I damage the capo? 1. Signing up for a PayPal account is now optional. This means you can complete the payments first, and then decide whether to save your information in a PayPal account for future purchases. c. Click "Check Out with PayPal". DO NOT USE "CHECKOUT"
e. Enter your details, name, address, credit card, email address, etc. we will issue and email to you an invoice with instructions.